Frank de Boer sacked by Crystal Palace: Muddled thinking but the right decision? Crystal Palace chairman Steve Parish posted on social media on Sunday to offer a message to supporters following a fourth straight Premier League defeat without a goal under new manager Frank de Boer. The words were measured after the 1-0 loss at Burnley: "Some sense! We are four games in. It's a terrible start but we have to stick together." Fine sentiments - but sadly for De Boer, after only 77 days and a 'blink and you'll miss it' tenure as Crystal Palace manager, the idea of sticking together did not include the 47-year-old Dutchman, who was ruthlessly sacked on Monday morning. After the lengthy due diligence involved in finding a successor to Sam Allardyce following his surprise departure in May, how have Palace ended up in the latest episode of managerial instability that is threatening to become Selhurst Park's hallmark? How low do you go for a start as bad as Palace's? The appointment of De Boer - a figure of genuine pedigree in the European game after winning 112 caps for the Netherlands and a man steeped in the passing style of Dutch masters Ajax - marked a significant departure from Palace's traditional managerial template. The Eagles had dealt in managers whose currency was pragmatism with the appointments of experienced, steady hands such as Neil Warnock, Tony Pulis and, last season when they needed rescuing from relegation after the sacking of Alan Pardew, Allardyce. And the policy had worked. But Parish opted for a sea change in the summer, talking of "evolution over a period of time". The time afforded for that transformation, however, ultimately proved to be just four games and, in reality, it was only really three as it has now emerged the new manager was on borrowed time even before the close of the transfer window at the end of August. De Boer himself had seemed to buy into the idea of a new direction, saying upon his appointment: "The aim is to be a solid Premier League team, not struggle with relegation. This club can grow further and further. They spend a lot of money and there is the possibility to do something well with that money." But Palace and Parish clearly were not ready for the sort of evolution De Boer wanted to bring to Selhurst Park. Dougie Freedman was appointed as sporting director two months after De Boer's arrival, a move that smacked of an uncertain structure and thinking, a hastily arranged marriage of the sort that rarely ends well in football. And it seems discontent swiftly surfaced and festered, with Parish and Freedman unconvinced he could be a success even before August was out. Palace's players were struggling with the new, more measured passing style the manager was demanding and De Boer himself did not appear to be altering that style to suit his new players. It is already emerging that Palace's owners were receiving poor feedback on sessions and atmosphere on the training ground, as well as frosty relationships with certain players, with the manager also regarded as lacking input on transfer activity. It was a cocktail that was to prove unpalatable, very quickly, to Palace, Parish and the club's American owners, who are now left seeking a new manager, with former England manager Roy Hodgson waiting to step in. De Boer suffered with the impatience associated with owners in Serie A when he was sacked after only 85 days at Inter Milan - but little did he realise he would get even less time at Crystal Palace. The Dutchman will be well versed in the hard-nosed approach to modern football, but even the most experienced manager has every right to question his sacking after only four Premier League games. It is now clear there were serious differences behind the scenes, with De Boer even unhappy about the pre-season schedule arranged prior to his arrival, but this still constitutes drastic action to get rid of an experienced manager - one who won four successive Eredivisie titles with Ajax - so quickly. When De Boer heard Parish's message about "evolution over time" it may even have given him a warm glow after his swift demise at Inter, although he will have acquainted himself with the price of failure and the demands for instant results in the Premier League. After taking such a left turn from previous appointments, surely the new Palace boss required more than four games to imprint his different style on his new squad, no matter what cracks there were in relationships within the club? This was an appointment in its infancy and yet Palace have decided something is so fundamentally wrong that change is needed. De Boer may have turned out to be a poor appointment but to make this definitive judgement after only 360 minutes of Premier League action will leave him understandably asking whether he was given a fair crack at making a success of his job. It appears he was unhappy with what he regarded as Parish's influence on first-team matters, as well as the late arrival of centre-back Mamadou Sakho from Liverpool, with Palace only succeeding with a fourth offer of £26m hours before the transfer deadline. He was also a victim of football's fine margins in what turned out to be the final game - that 1-0 loss at Burnley - although it now seems even victory would not have spared him the sack. De Boer had to legislate for Lee Chung-yong inexplicably sending a horrendous backpass straight to the feet of Burnley striker Chris Wood for the game's decisive moment and Scott Dann heading wide of an open goal from six yards in the dying seconds. Of course other factors were at work - not forgetting he also lost his most talented player, Wilfried Zaha, for a month to injury - but Burnley boss Sean Dyche admitted Palace were the better side and it was not the performance of players who had given up on De Boer. Former Palace winger John Salako told the BBC: "I do think it's too soon. It's a real shame. Frank de Boer came in with pedigree and class, he's a world-renowned name." It was the shortest tenure in Premier League history and De Boer was not handed huge funds to make a difference. He brought in young Ajax defender Jairo Riedewald for £7.9m and Sakho from Liverpool - although the latter was already known to Palace after a successful loan spell last season. Ruben Loftus-Cheek and Timothy Fosu-Mensah joined on loan from Chelsea and Manchester United respectively, but De Boer barely had time to fashion a blend and style for his new squad. A brief Instagram post predictably confirmed he was "disappointed" - and it will be no consolation that many shared that emotion, as well as shock, at a decision taken so quickly. An unpopular call by Parish - but is it the right one? This was not a view gaining much support after Palace announced De Boer's sacking, with condemnation of the haste and perceived lack of opportunity for the new manager the overwhelming reaction. And there is no way Parish, presumably in league with Palace's American owners - billionaire investor Joshua Harris and his business partner David Blitzer - can escape criticism. Palace, initially linked strongly with Marco Silva before he went to Watford, took time and trouble to appoint De Boer. This was a carefully thought out strategy to take the club to the next stage of its development. It was also not a rushed appointment. Allardyce resigned on 24 May and it was more than a month later, on 26 June, that De Boer was given the job. If there are questions about De Boer, then questions must also be asked about those who appointed him and had to admit their mistake in the short order of four league games. "I think they've panicked," former Palace star Salako told BBC Radio 5 live. "I think they've pushed the button too early." It is also clear that Palace's sense of self-preservation has shaped this move. The fear of relegation kicks in almost instantly in the Premier League and the club's American owners, perhaps not fully aware of its consequences until they got their feet under the table at Selhurst Park, will share that dread as they look at their investment. "The biggest factor will be the owners - they don't understand relegation," added Salako. "In America you don't have relegation. Part of their business plan is to stay in the Premier League. Relegation is just disaster." In Parish's defence - and not too many were acting as his shield on Monday - he has made decisions that have ended well for Palace in the past, such as the appointment (albeit briefly and eventually acrimoniously) of Pulis and then bringing in Allardyce in December 2016 in succession to Pardew with the club one point above the relegation zone - eventually finishing 14th. He also obviously felt De Boer's position, given the differences on both sides, was beyond repair and needed an instant remedy. Parish, if he believes he has made a mistake, has at least resolved it quickly. The chairman may also take solace from the last Premier League club to suffer such an adverse public reaction to a managerial change, namely Leicester City after they sacked Claudio Ranieri only nine months after the most unlikely title triumph in Premier League history. Time proved that perhaps the Foxes were right to take such drastic action as Leicester, under then caretaker Craig Shakespeare, were revived and ended the season in the comfort of safety after threatening to follow a Premier League win with relegation. Former England manager Hodgson, who looks certain to succeed De Boer, will be regarded as a "safe hands" candidate who will bring the sort of stability that enabled Fulham and West Bromwich Albion to flourish under his experienced guidance. There is, however, still a heavy roll of the dice about the 70-year-old's proposed appointment. Hodgson's iron-clad confidence may not have been affected by the humiliating end to a disappointing reign as England manager, resigning after losing to minnows Iceland at the last-16 stage of Euro 2016 - but his credibility has suffered a huge dent. He looked a broken man after England's loss and Palace will hope a lengthy break has rejuvenated this well-travelled manager. Hodgson, as one of his predecessors Steve McClaren found at various locations, will need to make a fast start or his England ignominy will be quickly, and painfully, revisited. Parish, after such a bold move, will pray that is the case. What's going wrong for De Boer & Palace? 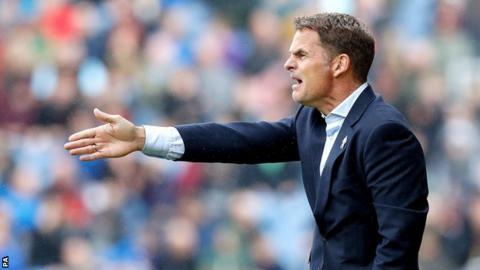 Read more on Frank de Boer: What's going wrong for Crystal Palace's new manager?